New Delhi: People of Rajasthan will take revenge on the BJP for insulting Rajput leader and former Union minister Jaswant Singh in the December 7 assembly election, his son Manvendra Singh said on Thursday. Singh, who joined the Congress on Wednesday, exuded confidence in the leadership of Rahul Gandhi saying it is important for the country's leader to have humanity, which the Congress chief has in abundance. 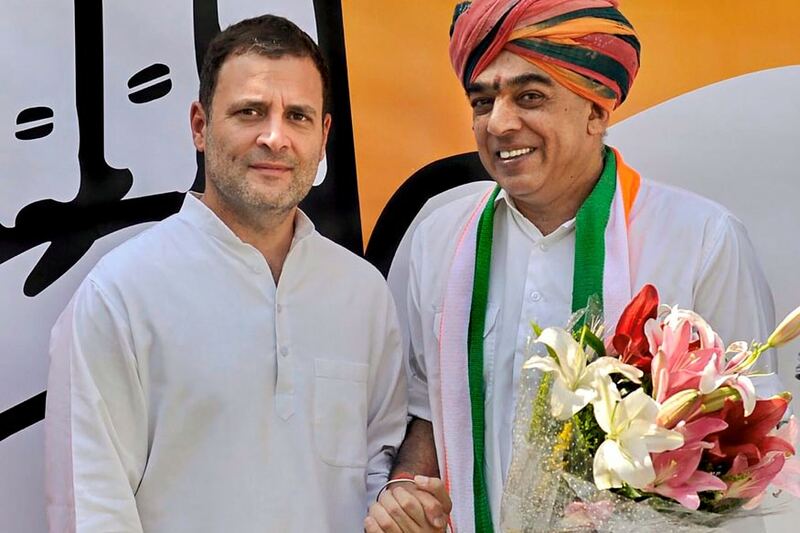 "The people of Rajasthan, especially from Barmer, Jalaur, Jaisalmer and Jodhpur will take revenge for that insult caused to my father Jaswant Singh when he was denied the party ticket and was expelled," he told PTI. BJP veteran Jaswant Singh was denied the party ticket in 2014 Lok Sabha elections but he contested as an Independent from Barmer and lost. He was later expelled from the BJP for contesting the election against the party's official candidate. "After Atal ji left, values in the BJP have also gone and that old traditional values are no longer there in the BJP. I feel, the decision taken by me has Atal ji's blessings," he said. "Joining the Congress was not just my personal decision, it was also a collective decision taken by my supporters who are fighting for their self-respect," he said. Asked if the Congress chief was capable of leading the country, Singh said in a democracy the leader has to possess the quality of humanity and if one does not possess that one cannot understand and feel the pain of the poor. "Rahul ji is a repository of humanity. I have seen him very closely and the humanity he possesses very few leaders do in this country," he said. Asked about the state of affairs in Rajasthan, he said he had talked to Prime Minister Narendra Modi about it but no steps were taken. Training his guns on Chief Minister Vasundhara Raje, he said the people of Rajasthan have decided to remove her government and the upcoming elections will see a big change in the state. Rajasthan goes to polls on December 7 and the results will be out on December 11.